Natural cleaners are highly effective in the bathroom and kitchen, even when it comes to nasty food-borne bacteria like E. coli. Susan Sumner, head of the Food Sciences and Technology program at Virginia Polytechnic Institute and State University, found that all you need to wipe out Salmonella, Shigella and E. coli bacteria is a combination of household hydrogen peroxide and undiluted white or apple cider vinegar. 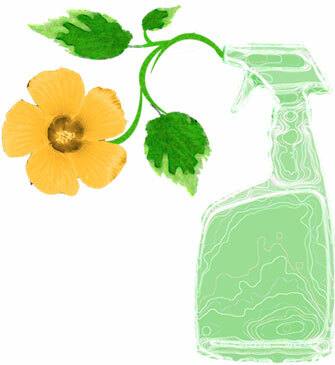 Put the two liquids in separate spray bottles and spray one immediately after the other, in either order. You can spray it directly on fruits and vegetables as well as on surfaces, such as cutting boards and countertops, for an effective, nontoxic disinfectant that can be wiped right off. Household vinegar can also take care of mold in the bathroom, killing off 82 percent of mold strains. For tougher mold problems, mix two teaspoons of tea tree oil and two cups of water, spray on and then scrub off after 30 minutes. Need spray bottles? Most drug stores will carry them with their hair care products.